In December 1688, the threat of a Jacobite attack on Enniskillen led to the raising of volunteer defence units, some of which were accepted into the Army in 1689. These included an infantry regiment commanded by Zachariah Tiffin. Tiffin’s Inniskillingers fought throughout the campaign in Ireland and survived the postwar reductions to become a permanent unit. Over the next century the Inniskillingers saw action across the world. Designated the 27th (Inniskilling) Regiment from 1751, they fought in the French Revolutionary and Napoleonic Wars alongside several new Irish regiments, including the 83rd, 86th, 87th and 89th Regiments. At Barrosa in March 1811, the 2nd/87th captured the first Napoleonic Eagle ever taken in battle by a British regiment. Their war cry (Fág an Bealach or Clear the Way! ), modified to Faugh A Ballagh, became the 87th’s motto. At Waterloo on 18 June 1815, the 27th (Inniskilling) Regiment held the centre of the Allied line against Napoleon, prompting a French general to comment that he had never seen such bravery before. Marking their service in the Peninsular War the 87th became a Fusilier regiment in 1827 as the 87th (Royal Irish Fusiliers). The first Victoria Crosses were earned during the Indian Mutiny in the assault on Jhansi on 3 April 1858, when four members of the 86th (Royal County Down) Regiment were decorated for their valour. In 1872, regiments were brigaded in pairs and assigned training depots in their recruiting areas in a process that, in 1881, led to the creation of new two-battalion regiments. 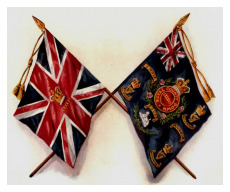 The 27th (Inniskilling) and 108th (Madras Infantry) Regiment became the Royal Inniskilling Fusiliers; the 83rd (County of Dublin) and 86th (Royal County Down) the Royal Irish Rifles and the 87th (The Royal Irish Fusiliers) and 89th (Princess Victoria’s) Regiment the Princess Victoria’s (The Royal Irish Fusiliers). To mark the gallantry of these and other Irish units in the Boer War, Queen Victoria ordered the creation of the Irish Guards as well as ordering that all Irish regiments should wear shamrock on St Patrick’s Day. In the First World War many additional battalions were formed and fought in Gallipoli, Salonika and the Middle East as well as on the Western Front. Battalions of Inniskillings, Rifles and Irish Fusiliers served in 10th (Irish), 16th (Irish), 36th (Ulster) and many other divisions. Thirteen Victoria Crosses were earned, including four on one day on 1 July 1916, the opening day of the Battle of the Somme. Since there were Leinster, Connaught and Munster regiments, the War Office decided that there should also be an Ulster regiment and the Royal Irish Rifles became the Royal Ulster Rifles on 1 January 1921. In 1937, the London Irish Rifles became a Territorial Army battalion of the Rifles, and the only TA battalion of an Irish regiment. During the Second World War all three regiments served with distinction on many fronts from Europe to the Far East. Battalions from each regiment formed 38 (Irish) Brigade, created after promptings to and by Winston Churchill, which fought in the Tunisian, Sicilian and Italian campaigns with particular distinction at Centuripe in Sicily and the Battle of Monte Cassino in Italy. Both regular battalions of the Royal Ulster Rifles landed in Normandy on 6 June 1944 – D Day – one by air and the other on the beaches; a unique distinction. With Indian independence and the withdrawal from empire, the Army was reduced considerably after the war with most regiments losing their second battalions. Further reductions brought about the amalgamation of the three regiments on 1 July 1968 to form The Royal Irish Rangers (27th (Inniskilling) 83rd and 87th). Over the following 24 years the Rangers continued the tradition of service. Both battalions served in Northern Ireland on Operation BANNER where they worked alongside soldiers of The Ulster Defence Regiment which had been formed in 1970 to protect the province from terrorist activity. 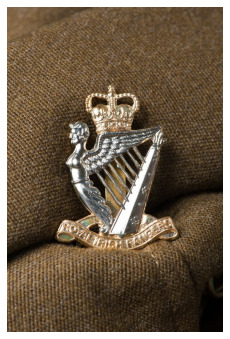 When the end of the Cold War brought further defence reductions both regiments amalgamated on 1 July 1992 to form The Royal Irish Regiment with the former UDR battalions becoming Home Service battalions. 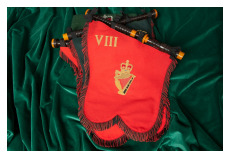 The unique service and sacrifice of the UDR and Royal Irish (Home Service) was marked by Her Majesty the Queen’s award of the Conspicuous Gallantry Cross to the Royal Irish Regiment on 6th October 2006, prior to the Home Service battalions disbanding in 2007. With one Regular and one Reserve battalion, each deployable in the light infantry role, the Royal Irish Regiment continues to serve wherever it is needed. In recent years it has served in Kosovo, Iraq and Afghanistan with the same élan as was shown by so many generations of Irish soldiers over more than three centuries. After the Regiment’s 2008 deployment to Afghanistan the courage of soldiers of the Regiment was recognised with the award of three Conspicuous Gallantry Crosses and three Military Crosses. It was acknowledged as one of the most effective units in 16 (Air Assault) Brigade. 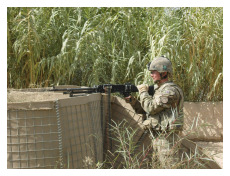 Click on Helmand Mission to find Richard Doherty's book describing events from 1 R IRISH's deployment in Afghanistan on Operation HERRICK 8. During the Regiment's third tour in Afghanistan, the 1 R IRISH Battle Group was engaged in the largest Air Assault operation to have been conducted by the Regiment since its antecedent regiment, The Royal Ulster Rifles, was involved in Operation VARSITY to capture the Rhine Crossings in the Spring of 1945. 1st January 2015 saw the Regiment's 15 year association with 16 (Air Assault) Brigade draw to an end as a result of Army 2020 reorganisations. The Regiment assumed a Light Mechanised role in 160 (Wales) Brigade, having worked through most of 2014 to define this new concept of operating with legacy vehicles from the Afghanistan campaign. Much of the doctrine used in the role was written and tested by the 1st Battalion.